Liverpool beat Toulouse in the first leg of their Champions League third-round qualifier with a patient and professional performance. Andriy Voronin chested down a ball, turned and rifled in a rising 25-yard shot to put the Reds ahead at the end of a low-key first half. The closest Toulouse came to a goal was a glancing Johan Elmander near-post shot which was saved by Pepe Reina. But the Reds kept their rivals at arm's length with ease to secure the win. Prior to the game, much was made of Peter Crouch allegedly being unhappy at being left out of the squad for the Premiership opener at Aston Villa last Saturday. The lanky striker started at the Stade Municipal as one of six Reds changes but found time and space at a premium against the home side. Toulouse defended in numbers as they stayed deep and disciplined with Liverpool probing for an opening. 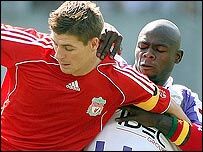 Both defences were on top in the sweltering heat and a mazy Ryan Babel run - leading to Steven Gerrard wildly slicing a shot high and wide - was the closest to a noteworthy effort early on. The game needed something special to spark some life into it and Voronin provided it with his first competitive goal for the club. He latched on to a Crouch flick-on after 43 minutes and scored with a powerful shot into the top corner. Toulouse tried to quickly respond only for Achille Emana's acrobatic overhead kick to go narrowly wide. The goal forced Toulouse to become more attack-minded after the break and they started pressing the Reds higher up the pitch as they chased an equaliser. And the home side were finally given some encouragement when Elmander got in ahead of Sami Hyypia at the near post and angled in a shot which was saved by Reina. But that was as good as it got for the home side as they were comfortably contained by last season's Champions League runners-up. The only down point for Liverpool was a foot injury picked up by Gerrard that could keep him out of the weekend's showdown with Chelsea, but Liverpool are in command of this tie ahead of the second leg on Tuesday, 28 August. Toulouse: Douchez, Ebondo (Sissoko 83), Mathieu, Cetto, Fofana, Paulo Cesar (Gignac 69), Sirieix, Emana, Dieuze, Elmander, Bergougnoux (Mansare 46). Subs Not Used: Riou, Jonsson, Batlles, Fabinho. Liverpool: Reina, Finnan, Carragher, Hyypia, Arbeloa, Benayoun (Riise 59), Gerrard (Sissoko 65), Mascherano, Babel, Voronin (Torres 78), Crouch. Subs Not Used: Itandje, Agger, Alonso, Kuyt.